As part of the Habitat Management Plan for the Burn of Whilk wind farm, near Wick in Caithness, we are undertaking bog restoration works by ditch blocking in an area of deforested peatland to the south of the turbine array. In 2015 we identified the suitability of this area for ditch blocking due to its shallow slope, deep peat and appropriate ditch morphology. 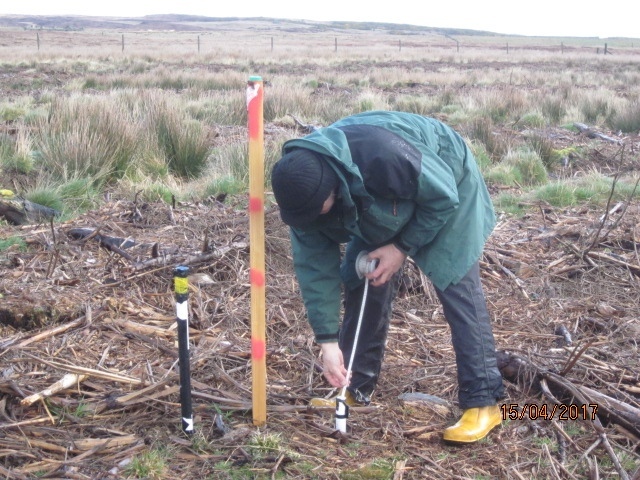 A year of baseline monitoring was undertaken from November 2015-2016 to inform the assessment of the hydrological recovery of the site and rewetting of the peat. The Environmental Research Institute (ERI) at The North Highland College UHI, Thurso, installed five water-level loggers across the restoration site and one in an adjacent control site. The loggers cover a range of distances from the ditches identified for blocking and provide data on temporal patterns of recovery of water levels. 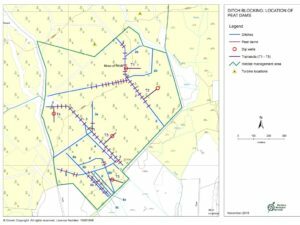 In addition, five transects of five dip-wells each were set up across the restoration site, plus one in the control site, at set distances from a drain, to provide data on water level variation and the spatial impact of drain blocking. Vegetation plot data was also recorded in the restoration and control sites. 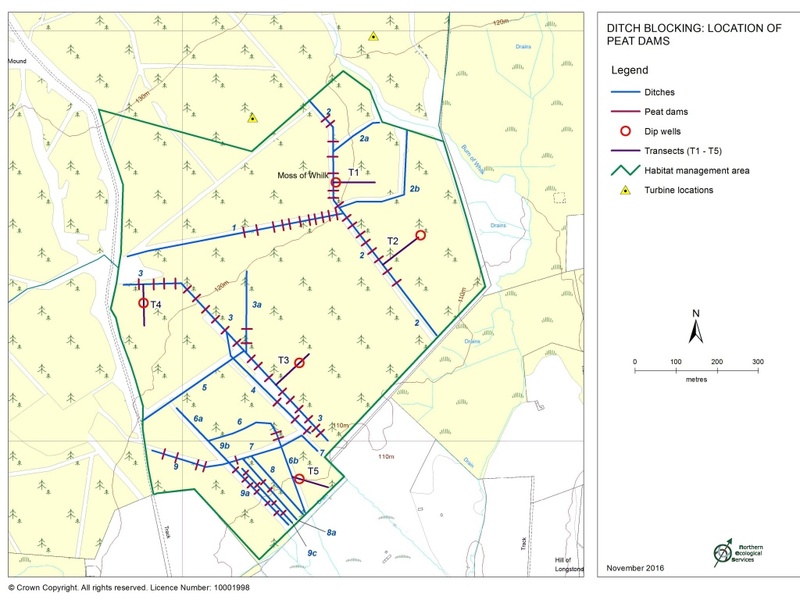 In November 2016 we specified and supervised ditch blocking operations on the restoration site, in which peat and turf dams were installed at regular intervals along the ditches identified for blocking. 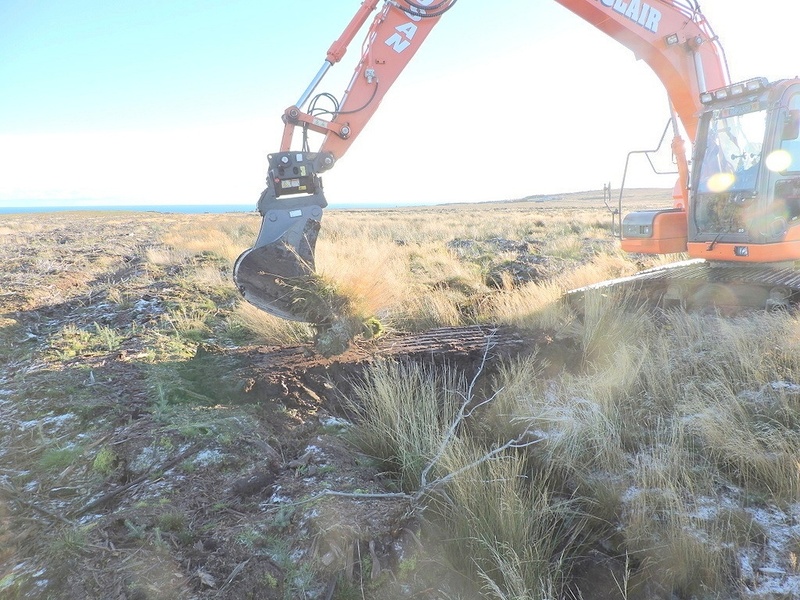 The work was undertaken by a local contractor with experience of working on peat. We are currently undertaking post-blocking hydrological and vegetation monitoring, which will inform management recommendations for the restoration site.